‘Mature’ rather than ‘old’ sounds more palatable to octogenarians (I know we’re only kidding ourselves…) but mentally, we are ‘all’ ages, depending on the mercy of the specific ailment we are suffering from on any particular day! I have no intention of being flippant about bad health (been there and have the clichéd T-shirt…) and will place it respectfully to one side for now. Most days, having sidled out of bed (crablike) and pinched myself… I gently ‘reassemble’ (really!) of a morning, eschewing the unfavourable mirror – trust me, there is one – shower and apply minimal make-up (no mutton-dressed-as-lamb stuff for me!). A simple, healthy, breakfast follows, and then I welcome what the day has to offer. Now retired to Spain, on warmer days (generous here!) we: ‘Im indoors’ and I venture near the Mediterranean sea around twice a week for breakfast or coffee or have same on our patio. When friends arrive from distant shores, we join them now and then for lunch or dinner; or go for a drive somewhere scenic, all of which is most pleasant. There is, of course, a BUT. We don’t always feel like spring chickens, and we do have our ‘off’ days, weather-wise, so it is comforting to have indoor pursuits like music, TV, crossword puzzles (husband), reading and – in my case – writing. And that is when the memories come creeping in! 1969. With three of my desired children born, the youngest son not yet one year old, a business to run (a large greengrocers/grocer’s shop) and a husband on the verge of having an ulcer, I did not want to hear my doctor announce: ‘An operation ASAP,’ after one of the first smear test results came back positive… That was on a Monday and I had the operation on the Friday, so hurray for a speedy NHS, then. The dreaded word: ‘Cancer’ was rarely mentioned then, so I told my biggest lie ever… and said I had a gynaecological problem – which was sorta true…(didn’t want to worry the folks unduly). All went well, and with no chemotherapy required. I was elated, despite having to stay in hospital for two long weeks… (Gold stars for my darling Mum and husband). On release, I felt so well I did a good shop, cleaned where needed and cooked a celebratory dinner for us all. And then I haemorrhaged. Imagining a clanging ambulance dash to hospital to receive pints of blood, I was shocked to be told by the Matron on the phone. “Put your bed on blocks, tear up a sheet, climb in and lie still until your doctor arrives.” Oh dear. Hours later… a young, most annoyed, gruff… assistant doctor arrived. “You’re very lucky, you know!” he said, frowning (My own, lovely doctor was on holiday). Injecting me with a needle the size of the Post Office Tower building… seeming surprised when I winced, he then gave me a HUGE tablet, on which I nearly choked (No exaggeration). I wondered, briefly, about his marital bedside manner, for his ‘professional’ one was the pits… I was still doubled up in pain (was that an ‘Exit’ sign I spotted on my retina?!) Meanwhile, he treated me as a damned nuisance. Fortunately, things changed. That was over fifty years ago, and it still makes me smile. I’ve a strong feeling that May is a popular month for many folk. It’s certainly my favourite. Usually… there’s more sunshine around; and the earth, with Mother Nature’s collusion, delights us at every turn. Buds pushing through and a colourful array of flowers to gladden any heart. A time of rebirth and renewal, giving hope a chance. What’s not to like?! And then there are plans germinating: holidays ahead? Or at least picnics and barbecues. If you plan being a beach-bum for a week or two, you’ll need something to read, and this is where people like me come in handy; us writers have our uses…. This time, I’ve collaborated with a worthy author and friend, Jean Wilson: no slouch with the written word. Jean has worn several hats in her time. She was a Queen’s nurse for many years and then became a Psychologist to needy children and adults. Humour, that vital element, is evident in a lot of her and my work, so whether you want to read a murder tale or something a little lighter, there’s something in our book of short stories for you. 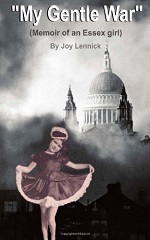 It is available from CreateSpace and also Amazon (paperback and Kindle). Why not order a copy and see for yourself?! As this post is a slight departure from the norm… I’d like to put strangers to my occasional ramblings in the picture, lest they send ‘the men in white coats’ to my door. Eldest son, Jason, is a blogger (among other things) and I have written the following in reply to his recent out-pouring of nonsense. Who would have believed it, after all the years of shady shenanigans; coded glances and messages secreted in ancient lavatory cisterns, the truth was revealed by our eldest son to the unwitting world. It is true, we ran a modest hotel in Bournemouth, before being pursued and approached by the Cirque du Soleil (not the Circus con Leche as stated by Jason). Seduced by our reputation – for ‘‘im indoors and yours truly were renowned for our prowess on the trapeze (despite the gathering years, and not known by many people) – the troupe were planning to ‘star’ us in a dazzling Spectacular, which would astound the public. While middle-aged, what we couldn’t do with our amazingly virile, versatile and talented forms, wasn’t worth talking about. Our stage names were Kermit and Dolly Rodriquez. Tragically, the spectacle was cancelled after Kermit developed a large corn on his big, right toe, and ‘delayed acne’ at the same time as my varicose veins became too prominent. It was more than our lives were worth to comment further about the man with the withered hand. Then Jason suggested plastic surgery would be ‘rejuvenating,’ (and otherwise advantageous) and our planned retirement to sunny Spain fitted neatly in with the circumstances. It also meant that our other two sons wouldn’t be able to find us, thereby paving the way for our eldest son to inherit our vast estates and the oil-fields in Texas when we popped our clogs. We were astounded by his dastardly plan. It is with huge relief that we have learned of a few, pertinent, arrests in the UK by MI5. This is most fortunate in that we were looking over our shoulders so frequently, we kept bumping into lamp-posts. We are also delighted to discover the truth about our eldest son. He arranged the plastic surgery to save our lives, which were in imminent danger at the time, and due to his magnanimous nature and a windfall from a grateful, former client (Jason was a ‘Professional Carer’ at one time, and not as he claims a Ninja assassin), he’s totally disinterested in our alleged fortune. Another massive bonus, we have been reunited with our other two sons, and so folks, as the sun sets in the Western, technicoloured sky, we are able to paddle in the Med. again with carefree hearts and be a united family..
Three of us flying Lennicks are planning to publish a book of humorous poems, anecdotes, jokes and fifty word stories in the near future. 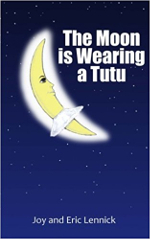 So, do look out for The Moon is Wearing a Tutu. By Joy, Eric and Jason Lennick. Available now for your reading pleasure – Food Glorious Food – a ten-story anthology, penned by various writers: members of WordPlay Forum. Published by Quirky Girl Publishing. A must for any occasion: beach or curled up in an armchair. Being, quite literally, an old hand at writing: childish stories and silly poems leading to keeping a diary, writing articles, travelogues, short stories, and eventually books, I have had a long love affair with the written word. It has never diminished. If anything, it means more to me in my twilight years, than ever. Oh the joys, and hiccups…of reading and writing! Naturally, over the years, fashions and fancies have changed, and I am now delighted to welcome and be involved in the world of the Blogger. The word itself somehow has as odd, unpleasant connotation, perhaps reminding one of mugger or blagger, but most of the Blogs I’ve read have been interesting, entertaining, erudite and some downright brilliant, with plenty of humour and twists. The dictionary calls the act of blogging a verb and a noun (depending on use), its full title being weblog, a piece of writing used on the internet. Of course, as with every genre of writing, there will always be abysmal bloggers and good ones, and naturally I would like to highlight three of – in my ‘umble opinion – the best.. The first name which springs to mind, is that of Carol Hedges, esteemed writer of many books (around fourteen I believe) and latterly the author of several, exciting, Victorian murder tales. Now, being a grandmother for the first time, Carol looks after her ‘little G” (two years old on 24th February) a few times a week and writes delightfully of their time together. Under the umbrella of “Adventures of L-Plate Gran – Never underestimate the power of Grandmas!” Carol writes regular gems which I thoroughly recommend to other grandmas. (Sadly I’m not one, but love them all the same.) In Carol’s offerings, you will find heart-warming episodes, zaniness and plain good fun. My second recommended Blogger is a man with the unusual name of Bun Karyudo (pronounced Boon-CAR-you-dough) who was ‘Born on one continent, raised on a second, and now lives on a third.’ A married man with two teenaged sons, he has written blogs with such titles as: “Exploding tea bags? Not my cup of tea.” And “The Cosmic Significance of Bathroom Tiles,” which gives a few clues as to the quirkiness of his nature. Pictured with a paper bag over his head, Bun pretends to be “A Billionaire Philanthropist.”(Always good to humour him, as he might just happen to be one!). I personally think that Bun should open an “‘Ideas Line” for Bloggers as he can find interest and humour in tripping over his own feet or being sick; not to mention waxing lyrical over anything from plastic bags to “A freezing day in Wigan.” I kid you not. Now I come to my third favourite Blogger and won’t apologise for so doing. Being a Brit – brought up not to praise myself or my family – I questioned myself soundly before ‘exposing’ my eldest son, Jason, to the limelight. And then I thought, ‘Why not?’ I’m a truthful person and I believe my eldest son to be an excellent Blogger. (All three sons are ‘good eggs,’ their hearts are in the right places and they are good citizens. It just happens that the eldest one also writes. Well!) Totally ignoring the word nepotism, an ugly concept, I continue… No stranger to originality or weirdness (a necessity in the blogging world) – and we’re back to quirky again – Jason also produces such posts as “Dinosaurs from Space” and “Klaatu barada nikto!” and a departure: a zany short story called ”Procrastination Man.” I can thoroughly recommend a read at his blog – halfbananas.